In our first piece covering 2018 new car sales, we looked into overall sales across the industry as well as a breakdown by vehicle segment. This time around we’ll focus on how different makes and models fared last year, as SUVs continued their roaring success. 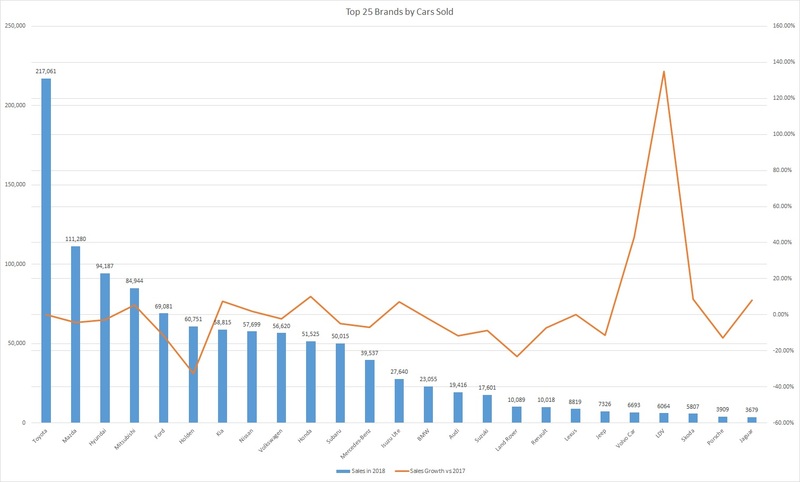 Toyota maintained a stranglehold on its position as Australia’s top selling brand, with the Japanese auto maker outranking its peers for the 16th consecutive year. With 217,061 vehicle sales to its name, Toyota was streets ahead of its nearest rival, Mazda, who sold 111,280 cars in 2018. Making up the top 4 was Hyundai, with 94,187 vehicles sold, and Mitsubishi who achieved a record year with 84,944 units. In terms of annual growth, the leading quartet of manufacturers recorded growth of 0.2%, -4.4%,-2.9% and 5.3% respectively. Turning to Australia’s iconic duo, Ford and Holden, it was the blue oval brand that took out the honours for the first time in 21 years. This was despite Ford’s sales slumping 11.6% to 69,081, as Holden’s dived 32.7% to 60,751. Both car companies recorded their lowest sales since the 1960s after high profile marketing campaigns and improved warranty terms failed to motivate buyers. Elsewhere, Kia, Honda and Isuzu increased sales from high bases, while Volvo, LDV, Skoda and Jaguar also managed strong gains but from lower starting points. Meanwhile, other well-known European manufacturers took a hit, with Volkswagen sales down 2.4% to 56,620; Mercedes-Benz lower by 7% to 39,537; BMW dragging 2.4% to 23,055; Audi falling 11.8% to 19,416; and Renault behind by 7.3% to 10,018. Topping the charts was Toyota’s HiLux, which achieved a couple records in the process. Not only did the model’s 51,705 sales set a new record among all utes, but it also emerged as the first model in 10 years to pass the 50k mark. In second place was another ute, courtesy of Ford. The Ford Ranger accounted for nearly two-thirds of the company’s sales, with 42,144 units bought by motorists. Not far behind, the Toyota Corolla – one of 3 vehicles from the manufacturer in the top 10 sellers – led the passenger car segment with 35,230 registrations. Its peers, the Mazda 3 and Hyundai i30 followed thereafter, with 31,065 and 28,188 units. While SUVs have been all the craze, the first to feature among the top selling car models was the Mazda CX-5. The vehicle placed 6th among all cars sold, recording 26,173 units. Holden was noticeably absent among the best sellers, with its only representative in the top 25 being the Colorado. The vehicle fell short of expectations selling only 18,301 units, even surpassed by the likes of Isuzu with its D-max. Compounding the manufacturer’s woes were a sharp drop-off in sales of its Commodore model, as it moved towards an import version.